» How big is a human cell? 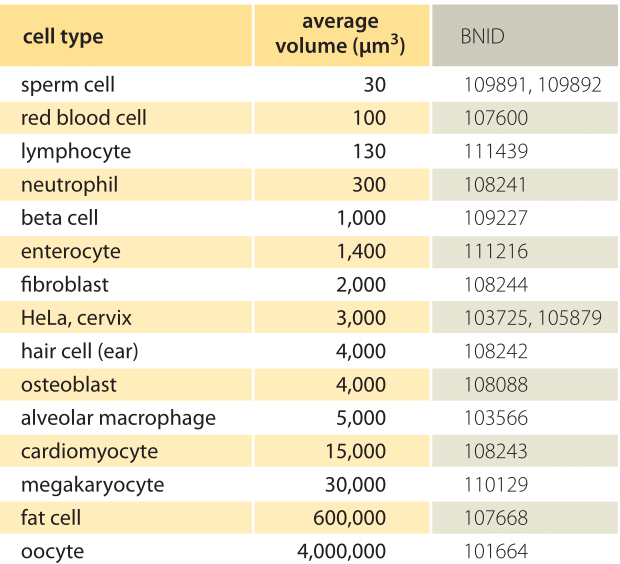 Table 1: Characteristic average volumes of human cells of different types. 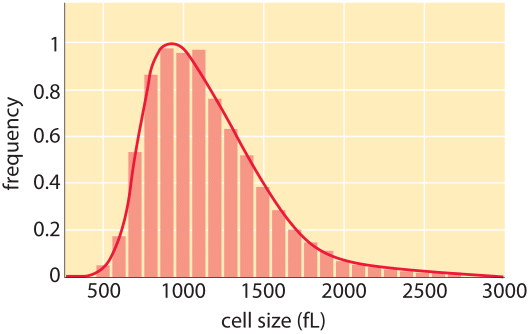 Large cell-cell variation of up to an order of magnitude or more can exist for some cell types such as neurons or fat cells whereas for others the volume varies by much less, for example red blood cells. The value for beta cell comes from a rat but we still present it because average cell sizes usually changes relatively little among mammals. A human is, according to the most recent estimates, an assortment of 3.7±0.8×1013 cells (BNID 109716), plus a similar complement of allied microbes. The identities of the human cells are distributed amongst more than 200 different cell types (BNID 103626, 106155) which perform a staggering variety of functions. The shapes and sizes of cells span a large range as shown in Table 1. Size and shape, in turn, are intimately tied to the function of each type of cell. Red blood cells need to squeeze through narrow capillaries and their small size and biconcave disk shape achieve that while also maximizing the surface area to volume ratio. Neurons need to transport signals and when connecting our brains to our legs can reach lengths of over a meter (BNID 104901) but with a width of only about 10 µm. Cells that serve for storage, like fat cells and oocytes have very large volumes. The different shapes also enable us to recognize the cell types. For example, the leukocytes of the immune system are approximately spherical in shape while adherent tissue cells on a microscope slide resemble a fried egg with the nucleus analogous to the yolk. In some cases, such as the different types of white blood cells, the distinctions are much more subtle and only reflected in molecular signatures. Mature female egg cells are among the largest cell types with a ≈120µm diameter. Other large cell types include muscle fiber cells that merge together to form syncytia where multiple nuclei reside in one cell and megakaryocytes, bone marrow cells responsible for the production of blood platelets. 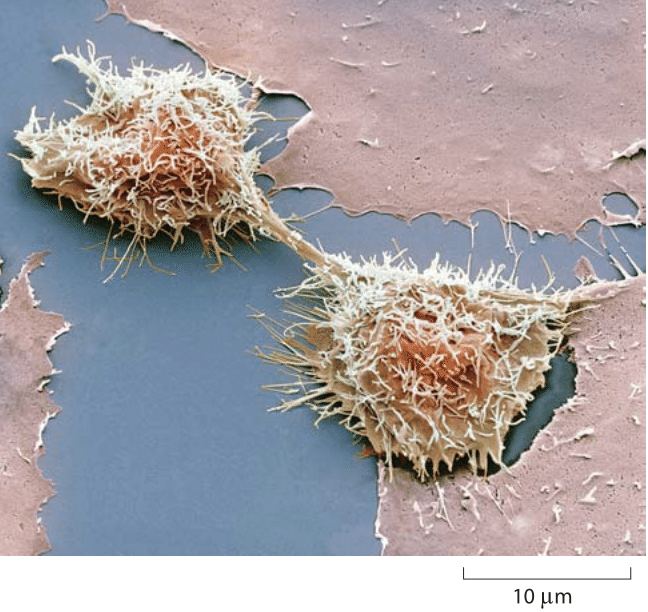 Both of these cell types can reach 100 µm in diameter (BNID 106130). Red blood cells, also known as erythrocytes, are some of the smallest and most abundant of human cells. These cells have a characteristic biconcave disk shape with a depression where the nucleus was lost in maturation and have a corresponding diameter of 7-8 µm (BNID 100509) and a volume of ≈100 µm3 (BNID 101711, 101713). Sperm cells are even smaller with volume of about 20-40 µm3 (BNID 109892, 109891). Certain human cell lines have been domesticated as laboratory workhorses. Perhaps the most familiar of all are the so-called HeLa cells, an example of which is shown dividing in Figure 1. Such immortal cancer cell lines divide indefinitely, alleviating the need to sacrifice primary animal tissue for experiments. These cell lines have been used for studies such as the molecular basis of signal transduction and the cell cycle. In these cell types, the cell volumes are captured by a rule of thumb value of 2000 µm3 with a range of 500-4000 µm3 (BNID 100434). HeLa cells adhere to the extracellular matrix and like many other cell types on a microscope slide spread thinly to a diameter of ≈40 µm (BNID 103718, 105877, 105878) but only a few mm in height. When grown to confluence they press on each other to compact the diameter to ≈20 µm such that in one of the wells of a 96 multiwell plate they create a monolayer of ≈100,000 cells. One should note that as in bacteria and yeast, average cell size can change with growth conditions. In the case of HeLa cells a >2 fold decrease in volume was observed when comparing cells 3 days and 7 days after splitting and re-plating (BNID 108870, 108872). A snapshot of the variability of mammalian cells was achieved by a careful microscopic analysis of a mouse lymphocyte cell line as shown in Figure 2. The distribution is centered at about 1000 µm3 with a variance of about 300 µm3. To put these cellular sizes in perspective, if we think of E. coli as having the size of a human being, then a HeLa cell is about the size of a blue whale. Our examination of the sizes of different cell types will serve as a jumping off point for developing intuition for a variety of other biological numbers we will encounter throughout the book. For example, when thinking about diffusion we will interest ourselves in the time scale for particular molecules to traverse a given cell type and this result depends in turn upon the size of those cells.